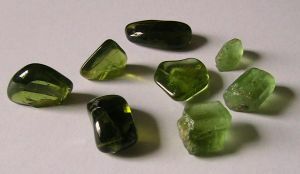 Peridot or Olivine (called Chrysolite by the ancients): this cyrstal balances the glandular system, aids tissue regeneration, has beneficial influence on heart, pancreas, spleen, liver, adrenals, purifies body of toxins, enhances bloodstream, overall balancer and tonic for body and mind, helps reduce lethargy and laziness.Peridotaligns subtle bodies, increases intuitive awareness, reduces stress, stimulates mind, accelerates personal growth, opens new doors of opportunity, and helps turn dreams into reality. It also helps heal hurt feelings and protects the central nervous system. Peridot is the Modern Birthstone of the star sign Virgo. In Traditional Astrology Peridot is considered the Traditional Birthstone of the star sign Libra. In the 12 tribes of Israel, the tribe of Asher is assigned the zodiac sign Libra and has the gemstone Chrysolite (another name for Peridot) ascribed to it. The 17th century Christian astrologer William Lilly associated Chrysolite or Peridot with the planet Venus. The famous mineralogist George Frederick Kunz in his 20th century book 'The Curious Lore of Precious Stones' associated Peridot with the planet Mercury.